There are three checkers that belong to Alice in a n x n grid board. There may also be some neutral checkers in some of the cells. Bob must place some checkers on the board in such a way that it is impossible for Alice to make any pair of her checkers meet after a number of moves. A valid move involves Alice moving one of her checkers up, down, left or right to an empty cell. Bob cannot move his cells or add new ones after Alice starts moving. Return the minimum number of checkers Bob needs to place, or 100 if it is impossible no matter what Bob does. n <= 20. Alice&apos;s checkers will always be initially placed in the border rows/columns. The initial thing to notice is that all that we need to do is to put new checkers in a way that all paths between each pair of checkers are blocked. For now on, we will forget of the distinction of neutral (&apos;N&apos;) checkers and Bob&apos;s checkers. We will instead consider &apos;N&apos;s in the board as obstacles that don&apos;t allow Alice&apos;s checkers to move to them. The objective is to find the minimum number of additional obstacles to add to the board so that the paths between Alice&apos;s checkers are blocked (Or return 100 in case it is not possible). After some analysis we should conclude that although the constraints are small, it does not seem approachable to find a brute force method. Classical ways to cut paths like the min-cut algorithm don&apos;t seem to fit this three checkers scenario. There is only one interesting bit left: The constraints ensure us that Alice&apos;s checkers will be at the edge/border of the board. It is likely that the solution requires us to use this constraint. These sequences of connected obstacles are curiously 8-connected (Two connected cells need to be adjacent or have a corner in common) as opposed to 4-connected as the actual paths that the checkers can take. As long as the sequence of cells connects the two partitions of the border there is otherwise no other requirement for the sequence of obstacles that block the checkers. This sequence of connected cells is, of course, a path of cells. We need to add obstacles to the minimum number of cells such that there is a path of cells with obstacles connecting the two parts of the board. We can approach this problem as just "find the path of cells with the minimum cost to fill with obstacles". Let us then find a shortest weighted path between the two edges. We can use any cell that does not contain Alice&apos;s checkers, the cost to include a cell is 0 if the cell already contains an obstacle (Neutral checker) or 1 otherwise (Place one of Bob&apos;s checkers). There can be plenty of paths and plenty of shortest paths, but we only need to find the minimum cost. 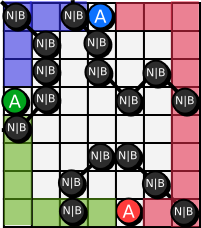 In the image you can see the shortest path between the two edges of the board and the two cells that were empty before. So the shortest path has cost 2, and we need to add two checkers to this board in order to block Alice&apos;s cells. 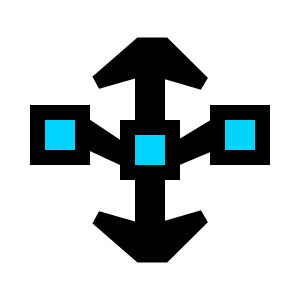 This center cell has a interesting property: For each edge, there is one path of cells with obstacles that connects the center cell and the edge. If the minimum paths between this cell and two of the edges overlap, then there will be another cell for which those paths will not overlap. There is a 8-connected path of obstacle cells connecting X and Y, and also a path connecting X and Z. There is an 8-connected path of obstacle cells connecting X and Y, and also a path connecting Y and Z. There is an 8-connected path of obstacle cells connecting X and Z, and also a path connecting Y and Z. There is one cell Center that has 8-connected paths of obstacle cells that connect it to X, Y and Z. We can try to calculate the minimum cost to have each of those options and then pick the one that costs the least. Each of the first two require us to do two instances of the shortest-path problem. The fourth one requires us to pick a cell (one of the n x n available) as the center cell, and find the shortest paths that connect it to each of the edges. It could be that in the first two cases, the paths that we find overlap, but if that is the case, then the cost to make the fourth case will be smaller and it will be correct. Depending on the shortest paths algorithm we use, this approach can work even for N=50. Let us, however, take advantage that N is low and just use Floyd-Warshall. int N = n*n + 3; //total number of vertices in our graph. // n x n cells + the three edges. // Pick cell i-th as the center. // Minimum paths between i and each of the edges. // Cases 1-3, there is no overlap, try pairs of edges. Hello. I'm blue.boy. I'm sorry that Mike found I have two handles and he disabled blue.boy. Now I cannot login it. My email addres is blue.boy.in.china@gmail.com. Let's communicate with emails. @vexorian: Hi could you please write a post describing your experience with topcoder, how you become a problem setter there. How easy or hard it is to be, how to get good ideas for problems, how you manage time for this, etc. If you have some empty time, please write on article about describing these things. I would really appreciate that.